Able to fit in your hand, the CrazyFlie is one kickass tiny quadrotor. How do you prove your competence to your office mates? Try building a remote controlled flying robot that can buzz over their heads and fit in the palms of their hands. Tobias Antonsson, Marcus Eliasson and Arnaud Taffanel all work at Epsilon Embedded Systems Öresund in Sweden. As part of their ‘competence development’ in their free time they got together in the company lab and built CrazyFlie. This tiny quadrotor is basically a printed circuit board with propellers, and can be remotely flown with a PlayStation game controller via RF. Watch it flit about in the video below. This little guy is just too cool. I had a chance to correspond with the Epsilon team and learn more about the project. It may take a few years, but CrazyFlie could be available for you to buy, or build on your own with open source specs. CrazyFlie’s most recent, and popular video. It just topped 185,000 views on YouTube (at time of writing). This thing looks very fun to fly. Antonsson, Eliasson, and Taffanel formed Daedalus Projects as a portal for all their sideline development endeavors. CrazyFlie is the first noteworthy task, and a really great opening move. It’s a fairly simple setup, but an ingenuous one as well. The entire package is only 12cm x 12cm, weighs around 20 grams, and can fly for about 4 minutes before its battery drains. The aircraft is built on PCB, with an onboard ARM 64 MHz microcontroller handling most of the flight feedback parameters to the four motors for the quadrotor props. 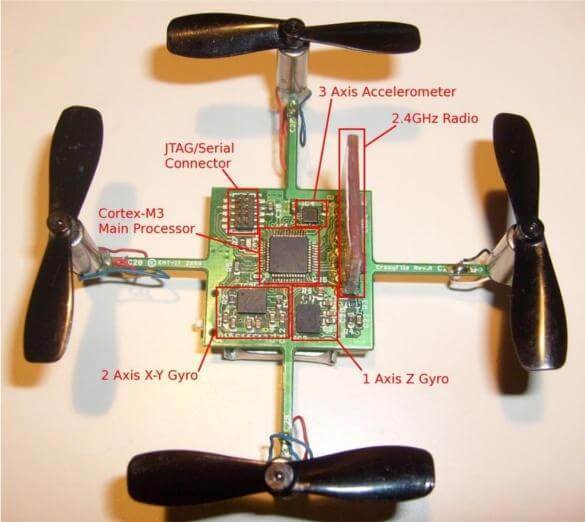 Two axis-gyros (XY and Z) along with a 3-axis accelerometer provide data to the microcontroller to keep the CrazyFlie stable. While electronics hobbyists will recognize that these specs are a little sub-optimal (3 axis gyros are available, for instance), the CrazyFlie was state of the art when it was first designed in 2009. I was pretty impressed by how well the Daedalus team could control their robotic version of a bumblebee. Using the game controller, the drone’s operator sends signals to a PC which is then transmitted to CrazyFlie through a USB RF dongle. There’s no altitude control, so you just have to alter the motor speed manually (on the gamepad) if you want it to fly higher or lower. Once you set the height, you can tilt the control stick and the CrazyFlie tilts and moves at speeds up to…well, the Daedalus team hasn’t actually measured the speed. But it’s fast enough to outrun Tobias’ cat. While CrazyFlie seems able to take a hit pretty well, the Daedalus guys tell me that the motors are only attached via hotglue and have to be repaired fairly often. Luckily the rest of the build is pretty robust. Even after a ten meter drop onto concrete the only parts that had to be repaired where the motor moorings. Stupid hotglue. We are currently working on a new version of the CrazyFlie and our goal is to, sometime in the future, be able to offer it as a kit. But since we all have full time jobs we are not sure how much time we can spend and when it will be finished. Be sure to look at our blog from time to time ;). When we are finished with this new version the plan is to release the software and the schematic for the hardware with an open-source license. We are very curious at seeing what other people can do with such a flying platform especially in terms of regulation and control. I heartily agree with the last statement. CrazyFlie isn’t a major company project, it’s just a fun demonstration of engineering prowess that three Swedes cooked up in their spare time and I bet there are many other hobbyists out there who could work with and improve the design. We’ve seen similar side projects in the past, but as more advanced tech becomes cheap and available (especially in robotics) the projects of the future may be far more impressive. Competency and innovation surround us, and if the Daedalus Project is any indication there is much more coming soon. Thanks to the CrazyFlie team for producing such a cool device and I hope the version you’re creating now turns out even better. Also, I’m #1 on your waiting list when you start selling these things. Remember that!